I've learned some things recently and one of those things is that I love being inside an elementary school. A couple of times a week I help out there and just as soon as I walk in, I feel like I belong there. Like a home I once had but have since forgotten about. And the longer I'm there, the more memories that flood in. It is a happy place for me. I often have some time I need to kill so I'll wander around the halls, trying not to look like a creeper, and look at all the kid art. It's magical. It delights me to no end. I'll stand for several minutes and look at each one, wishing I was there again. I think there's a big part of me that is just still a school-age kid. It's who I am, at the core of me. Not 5th, 6th grade so much (when it got complicated). I'm talking K, 1st, 2nd, maybe 3rd. Those were big, big years. And these kids are my peers. 4. 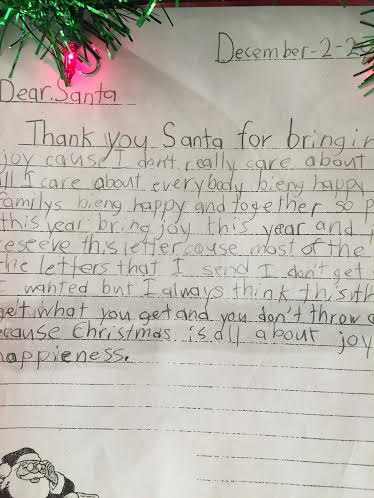 Anything else you might like to say to Santa. I took a few pics and wanted to show you because they are just gems and as I read them the Christmas spirit in my heart burned a little brighter. With most of them I've indicated using some kind of whosiwhatsit burn tool on photoshop to embolden the text that particularly stood out to me. Poor Santa-- almond milk. I actually like almond milk but it's just so funny to me. I just love getting a peek into a kid's brain, the things it really thinks about. These are the careful words this kid selected, a real worry, a serious concern, to write down for her class assignment. Also-- "that is the most kindest thing you can do." I want to hug her. 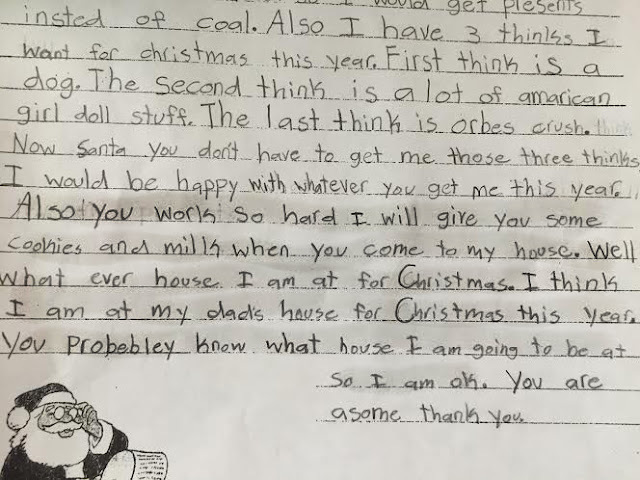 I also love the honest and sincere admiration these kids have for Santa. While some of them felt like borderline prayers to some kind of Santa-god, one cannot deny that the [for now] undying belief, the love is there and it is pure and oh-so sweet. And after reading these, it got me thinking. I know people have problems with Santa, that it feels sacrilegious, replacing Jesus or something. 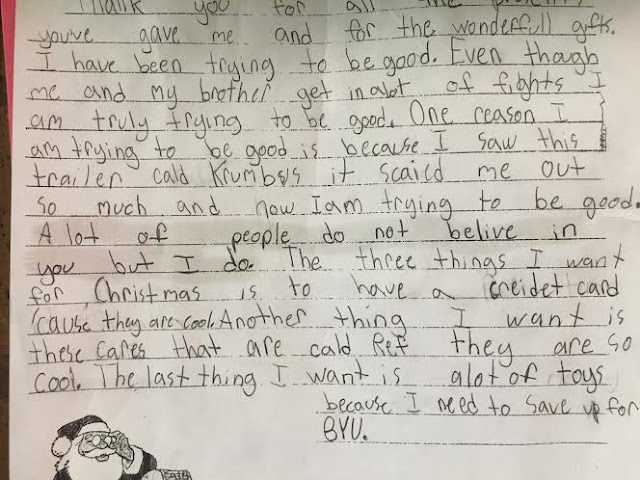 And while Santa is not Jesus, what I'm seeing from these letters is that these kids truly believe. They believe in someone kind and good and who they don't see. 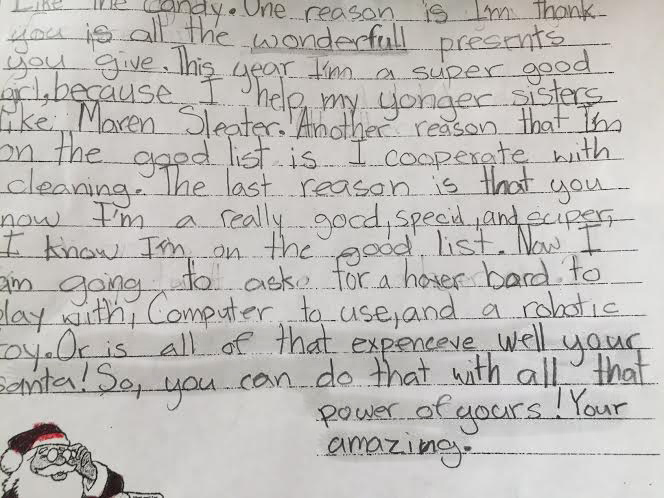 And if this Santa character can teach people to open their hearts to the possibility of more than what they see, something perhaps bigger than ourselves, then that sounds alright to me. 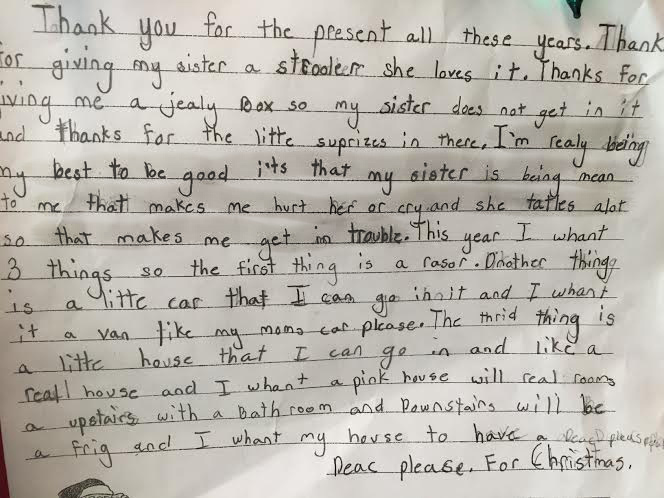 Maybe Santa is quite real after all. And clear pointing out of the facts, the evidence--shoveling the driveway. That's why I did it. You saw that, right? You noted that, right? 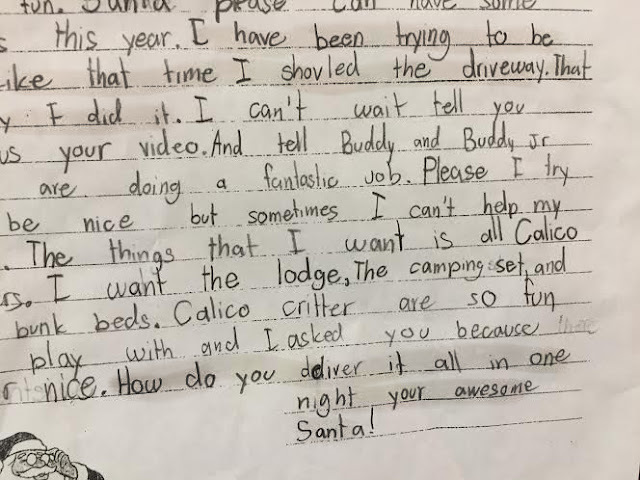 No need to beat around the bush with Santa. This next one is the first one that made me cry and when the real magic started to happen. That beauty of simple belief. Gets a person every time. I know there exist in the world kids who say the right thing, the good thing, the noble thing. Some of them may believe it but have secret selfish desires. Maybe they're just sucking up a little, who knows. But to even say them, to try to be that noble person, as a child, says a lot to me. This one cut off a little. Hopefully you can fill in the gaps. Also, the classic line-- "you get what you get and don't throw a fit." I wonder if Santa is completely on board with that. He must secretly want to get you want you want too. Despite his best efforts to be noble. This kid and I might be kindred spirits. This confession and honest explanation made me laugh and struck a familiar chord. I feel you, friend. I feel you. Also, as you read on, she really dreams big there at the end. And makes sure to tack on "for Christmas." In case you forgot. In case you didn't want to crush my Christmas hopes and dreams. Well done. Some more Santa admiration. Too cute. 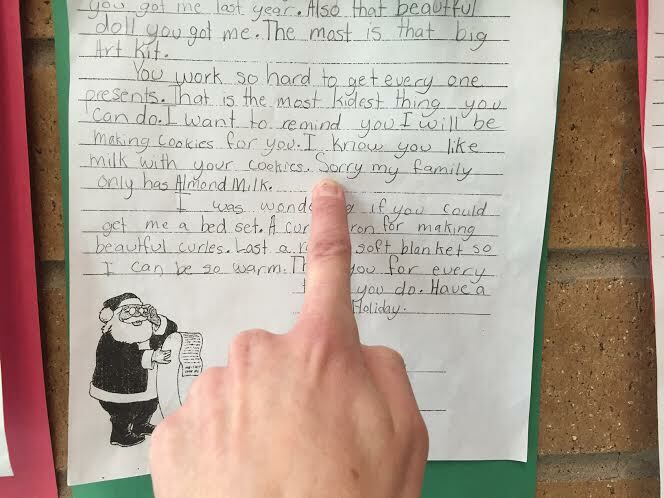 This is the next one that made me cry in the elementary school hallway (I'm crying at the school a lot these days) and sent a gutting jolt of real life straight through me. Are you kidding me? "Now Santa..."
Excuse me, I need to go get a tissue. And write a letter.